The purpose of the Endorsement Committee is to consider endorsing Republican candidates for public office in Jefferson Parish, and Statewide elections. All Republican Parish Executive Committee members residing in Jefferson Parish. All State Central Committee members residing in Jefferson Parish. The president or a representative elected by all bona fide Republican Women’s Clubs in Jefferson Parish. The organization must be recognized by the Louisiana Federation of Republican Women. A representative of the Republican Black Council in Jefferson Parish. A representative of the Republican Hispanic Council in Jefferson Parish. A representative of the Young Republicans in Jefferson Parish. All elected Republican officials residing in Jefferson Parish (excluding Judiciary). 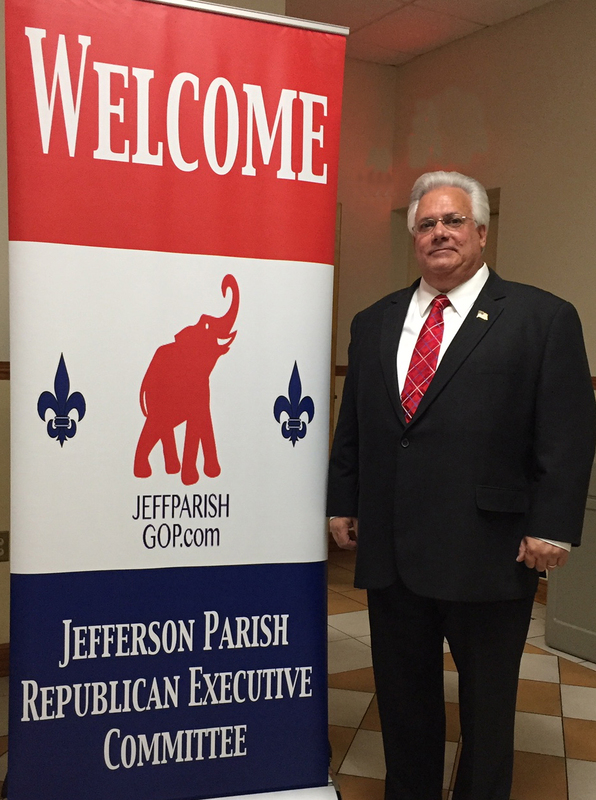 The Endorsement Committee meeting shall be convened by the Jefferson Republican Parish Executive Committee Chairman. The Chairman of the Jefferson Republican Parish Executive Committee shall serve as Chairman of the Endorsement Committee or, in his/her absence, the Vice Chairman. A quorum shall be fifty (50)% of the membership, excluding elected officials. Each candidate shall be notified in writing of date, time and location of the meeting for endorsement consideration. The Endorsement Committee may vote to take no action concerning a particular race. The Parish Executive Committee may cancel an endorsement of a candidate for cause (cause to be determined by the Parish Executive Committee). After the endorsement meeting has been called to order, the Chairman of the Endorsement Committee shall brief all Republican candidates in attendance regarding the rules and procedures of the Committee. Each Republican candidate shall be allowed three (3) minutes to discuss his/her candidacy. Before voting by secret ballot, the Chairman shall instruct all non-voting persons in attendance to depart the chambers. Voting by secret ballot for each candidate will be conducted in closed session. The Endorsement Committee members may discuss the candidate(s) prior to voting. After all ballots have been cast, all candidates and guest may return to the chambers for the official tally of votes. Each candidate or his/her second may witness counting the ballots. Only registered Republicans can be endorsed. “No Endorsement” is a candidate. If the tie vote is a result of one candidate and “No Endorsement”, the candidate will be endorsed. If the tie vote is a result of two candidates competing, the committee will endorse both. The Chairman of the Endorsement Committee shall notify the media promptly of its decision. These Endorsement Procedures were voted on and accepted by the Jefferson Republican Parish Executive Committee on April 14, 2003. These Endorsement Procedures were revised, voted on and accepted by the Jefferson Republican Parish Executive Committee on July 20, 2005. These Endorsement Procedures were revised, voted on and accepted by the Jefferson Republican Parish Executive Committee on June 1, 2015. The logos and marks of the Jefferson Parish Republican Party are to be used with the approval of the Jefferson Parish Republican Party. Unauthorized use is prohibited.